Rock and Roll. Soul. Jazz. Hip Hop. Rhythm and Blues. While everyone continues to use their gauging barometer readily boxing in creativity to confined spaces, along comes a group that defies the norm. Fusing hip hop, soul and jazz together to create ‘soul hop’, drummer Daru Jones (Jack White, Pete Rock, Jamie Lidell), guitarist Marcus Machado (The Family Stand, Kid Capri, Buddy Miles) and bassist Doug Wimbish (Living Colour, Sugarhill Records, Rolling Stones) combine expertise and influences to create a sound and experience like no other. 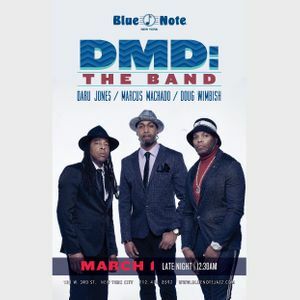 3 generations of musicianship and meeting of the minds will bring you Daru, Marcus and Doug, known as the collective DMD the Band. The story starts in March 2013 with an impromptu meet between Daru and Doug for a video shoot at MONO HQ in San Francisco, organized by MONO Creators artist relations representative Tom Gorton. Doug had just flown into town for a scheduled show with Living Colour at the Fillmore and literally walked off the plane into the MONO recording studio, where Daru was waiting. Gorton describes the initial introduction of Wimbish to Jones as “a meeting of the minds. We knew Doug Wimbish would react to Daru Jones - not just to his masterful beats, but to his humble-yet-confident personality. Watching a legendary artist like Doug Wimbish click with up-and-comer Daru Jones is evidence of the amazing power music has to connect us”. Indeed, the pair musically and spiritually found an instant connection. Over the course of the following year, individual touring and recording schedules guided the pair along separate pathways, yet Daru and Doug maintained conversations and plans to connect once again in the studio. It would be over a year later, in December 2014, that Daru and Doug met again, with a twist. With plans to spend a day in Doug’s Connecticut studio recording tracks, Daru took a train from NYC to Hartford. Exhausted after a hectic touring schedule, Daru slept soundly on the train, missing his transfer. What the pair initially planned to be a day of recording, turned into three hours - but those three hours laid the groundwork for 10 original songs. “We didn’t give up, we came to play” describes Wimbish. It was a casual conversation between Marcus Machado and DJ Spinna that eventually brought the “M” into “DMD”. It was the Summer of 2015 in Brooklyn NY in DJ Spinna’s studio, when Marcus, while finishing up his debut EP, was asked by DJ Spinna “if you could pick any musician, who would you like to have in your band”? Marcus replied, “Daru Jones, he’s the Buddy Miles of this generation”. DJ Spinna said “I know Daru, he’s a good friend of mine, let me get him on the phone”. During that phone call, Daru spoke of the tracks that he and Doug had recorded in CT the prior year - would Marcus be interested in laying down some guitar on the bass & drum tracks? Marcus instantly replied “yes! !” And with this, DMD the Band was born. The natural abilities that these artists possess has converged and resulted in a timeless masterpiece, the trio’s debut album scheduled for release in 2019. The laid back track “Westcoasting” is a fantastic composition that elicits happiness and takes one back to a fresh 70’s groove, while “The Boom” is a gritty, down and dirty kind of funk and hip hop fusion that rounds up the signature sound of DMD the Band. Channeling the euphoric vibrations of the 60’s era, DMD the Band recorded the initial tracks in lo-fi to capture the spur-of-the-moment and masterful sounds of a 60’s rock album. Soul-stirring drum kicks, roaring guitar solos and grooving bass lines are all par for the course. It is an album that revisits the sounds of yesteryear, all the while preserving and respecting the present sound that they have come to personify. In the meantime, DMD the Band is sure to satisfy sonic appetites with a performance teaser “Pregame Vol. 1 Live @ Sweetwater”. Shunning labels and defying the musical status quo, each artist in DMD the Band provides their own approach and unique perspective to the project. The musical styles visited on the album all merge harmoniously together to create original avenues of expression. ”Right now, I feel it’s something fresh and new to the masses.” states Marcus. It’s almost like having our own genre of music.” What makes this album so special? “It’s the 3 or more important generations of music genres, styles and influences with positive vibrations.” says Daru. DMD the Band is the reflection of a superb tuneful trifecta. The soulful energy between Daru, Marcus and Doug is undeniable. Their camaraderie and artistry radiates throughout each note. It’s a fantastic blend of sounds that will leave music connoisseurs of all genres wanting for more. There are many ways to describe DMD the Band. It can be heard as soulful, rock and roll. Or, perhaps a timeless retro and organic vibe. However, it would honestly be best for you to come to your own conclusion once you press play on this bold and stylish beauty. Look for a string of releases from this dynamic trio to surface in 2019 featuring the amazingly talented vocalists, Van Hunt, Amp Fiddler and funk genius and keyboardist, Bobby Sparks of Snarky Puppy plus more guest surprises. The band’s live performances include BRIC TV, Soul in the Horn with Natasha Diggs & Erykah Badu, Six of Saturns at Three Keys Ace Hotel New Orleans with Gilles Peterson, the halftime show at Madison Square Garden with the North Mississippi All-Stars and WimBash Music Festivals in CT and New Orleans DMD the Band is featured on the "Six Of Saturns Live Vol.1 vinyl compilation”. Daru Jones is one of the most respected drummers of his generation. Born to two professional musicians, he began playing the drums at the age of four. Though he got his start in the church, Jones has been influenced by musicians from a wide range of genres. These eclectic musical tastes have carried over into his own career as he has recorded, performed, and toured with renowned artists and producers such as: Jack White, Slum Village, Talib Kweli, Black Milk, Dwight Yoakam, Jamie Lidell, Pete Rock, Salaam Remi, Gloria Gaynor, Kim Burrell, Rance Allen, Black Violin, Ski Beatz & The Sensei’s, Lorenzo Jovanotti and Jon B (partial list). Jones has been the “go-to-drummer” in the hip hop game for over a decade. He has shared the stage with legends and emerging stars alike, including: Black Moon, Smif N Wessun, Q-Tip, Mos Def, Raekwon, Curren$y, Pharoahe Monch, Jean Grae, Black Sheep, Digable Planets, Camp_Lo, Smoke Dza, Theophulis London and Large Professor. Jones was mentioned as 'The Unsung Hero of Coachella' via Fuse TV, also 'Jack White's Secret Weapon' by Esquire Magazine. In 2018, Daru was seen on PBS with hip-hop's finest, Nas, performing "Illmatic" with the National Symphony Orchestra at the Kennedy Center. Jones was recruited to be the drummer and musical director for legendary hip-hop producer/artist Pete Rock and his new live band, the Soul Brothers, having also brought in Marcus Machado to as well. Marcus Machado, a former child prodigy playing guitar since the age of 2, was named in 2014 by Rolling Stone as the ”Next Young Gun”. As one of the world’s preeminent guitarist’s on the rise, Marcus played alongside Robert Glasper and Lalah Hathaway for the “Mr. Soul” documentary. In 2017, Marcus performed an electrifying National Anthem at Madison Square Garden before an audience of 20,000 fans at a New York Knicks event. Dubbed the “Young Jimi Hendrix“, Marcus had the esteemed opportunity to perform the Hendrix Flat Sessions in London on location at Jimi Hendrix’s former apartment. Machado released his debut EP “29” in 2015, displaying influences of Jazz, R&B, Funk, Rap, Rock and Gospel. Marcus has been sharing the platform with many notable and respectable artists including Anderson Paak, Marcus Miller & Georgia Anne Muldrow. As bassist for the legendary rap label Sugarhill Records backing Grandmaster Flash and the Furious Five to the pioneering Living Colour, Doug Wimbish has lent his innovative and creative bass grooves and sounds to a roster of world - renowned musicians. Considered a pioneer in hip hop bass playing and in the use of bass effects, alternate tunings and extended hand techniques, Doug’s mastery of the bass is unparalleled. In addition to working with Living Colour, who released their latest album, Shade, in 2017, Doug has recorded, produced and toured with many renowned artists, including The Rolling Stones, Mick Jagger, Jeff Beck, Joe Satriani, Herb Albert, Annie Lennox, Madonna, Carly Simon, Seal, Al Green, Billy Idol, George Clinton, Ms. Lauryn Hill, Kanye West, Freddie Jackson, Michael Bolton, Peter Wolf, Billy Idol and James Brown. Founder of the WimBash Music Festival Series, Doug continues to bring WimBash into the global market, creating a musical collaboration of artists that join together to have fun and be creative while raising awareness and much needed funds to benefit organizations that directly serve to educate our youth. Spotify: http://spoti.fi/2nguS0s + other digital stores.